Delivering your freight to or from Alaska safely, on-time, and at competitive rates are our top priorities. Every shipper has unique needs, so we provide a variety of options to fit your timelines and budget. A freight program tailored to your needs helps to ensure you get the most competitive rates while delegating the details of getting it done to your team at Alaska Traffic. You'll have 24/7/365 online access to all the details. And, if there is a delay or issue, you can count on being contacted promptly with an update. Available services: ship, barge, air (excluding hazardous materials), and trucking over-the-road. In most cases, ship and barge services provide the best value in terms of freight delivery times and rates. Combining shipments to the same destination, affording you volume discounted rates. Receiving, inspecting, and individually counting all pieces to assure shipment integrity. 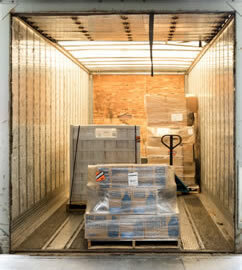 Loading shipments to dry, heated, chilled, or freezer containers, as needed. Seamless service from point of origin to point of destination. Inbound transportation at discounted rates. Arranging transportation aboard the most reliable ocean vessels to Alaska. Notifying Alaska Traffic Company customers of freight arrival in advance of actual shipment landing. Delivering on-time all year around. Less-than-container load (LCL) shipments and cross dock consolidation services are perfect for companies who often receive shipments from multiple vendors going to the same destination. Both services allow you to monitor your shipments and determine the best shipping program given volume and seasonality, paying only for the space you need and avoiding unnecessary minimum charges by taking advantage of volume discounted rates. Available twice weekly by ship, to and from central Alaska and by barge to Southeast Alaska. See our schedule for general information or contact us for details. We have relationships with most major water carriers providing service to Central, Southeast and Western Alaska throughout the year. Our relationships enable us to provide you with the best shipping solution to get your freight to its destination in your timeframe, while using the most suitable equipment type and size, and at your preferred price point. When Alaska Traffic manages your project shipments, you and your team can relax and focus on the project at hand. We work with shippers, truckers, water carriers, and consignees to seamlessly move your freight from origin to destination, and provide you with updates along the way. Frozen and refrigerated freight service. Available on the Wednesday ship sailing to and from central Alaska. Inbound freeze and chill shipments are accepted by appointment only on Monday's and Tuesday's. See our schedule for general information or contact us for details and to schedule an appointment. See our schedule for destination and schedule information and contact us for details. Available to central Alaska on a full load basis, and Southeast and Western Alaska on a LTL and full load basis. See our schedule for destination and schedule information and contact us for details. *Equipment size may be restricted for specific destination ports. Please contact us for more information. Contact us today to discover how we can make it easier for you to get your freight delivered between Alaska and other points in the US.